Look, fighting the undead beyond the wall can really put a toll on a person. 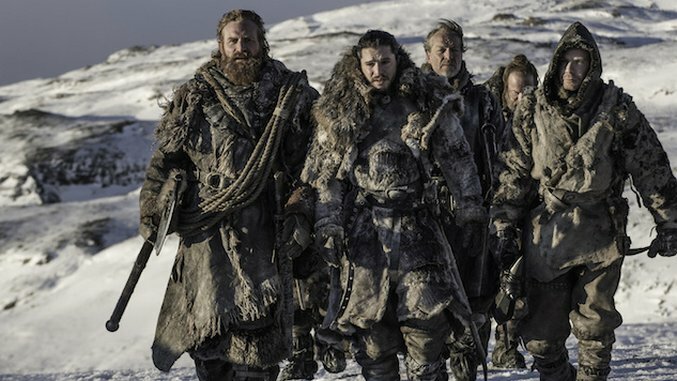 So don’t blame these Game of Thrones performers for letting loose a little and covering some tunes during their in-between time on set. Kristofer Hivju, Tormund Giantsbane himself, posted a fun little video on Instagram, featuring fellow wight hunters Iain Glen (Jorah Mormont), Rory McCann (Sandor “The Hound” Clegane) and Richard Dormer (Beric “I Have a Fire Sword” Dondarrion). The so-called “BROTHERHOOD WITHOUT BANJOS” as Hivju fashions them in the Instagram post, sings along to Tom Waits’ song “I Hope That I Don’t Fall In Love With You,” from Waits’ album Closing Time. Glen’s guitar-playing is accompanied by Dormer on the ukulele. No clear idea on where their leader Jon Snow (played by Kit Harington) was during this jam session—most likely makin’ whoopee with Daenerys Targaryen on a boat somewhere. The seventh season of Game of Thrones ended last Sunday, Aug. 27. Check out our review of the season finale here, the cast’s performance video below and a Tom Waits performance from the Paste Cloud beneath that. No word on when the first album from the Brotherhood Without Banjos will drop.